Rafsanjani’s out, and the race begins. This is the second part in a series on Iran’s June 14 presidential election. Part 1, with brief profiles of the leading candidates who’d filed to run, appeared last Friday. As the news of the latest turns in Iran’s presidential election develops—namely, that the Guardian Council, which oversees Iranian politics for Supreme Leader Ayatollah Ali Khamenei, has barred two opposition-minded candidates, including former President Rafsanjani—it’s useful to remember that Iran’s election is about Iran, not the United States. President Obama, who’d like to restart talks with Iran over its nuclear program after the election on June 14, may also need to talk to Iran about the civil war in Syria and about Afghanistan, too, where a renewed fighting season has boosted the Taliban’s fortunes. But, as always, Obama will have to deal with the Iran that exists in the real world, not the Iran he’d wish for. Iran’s system isn’t going away anytime soon, and that would have been true even if Ayatollah Ali Akbar Hashemi Rafsanjani and President Mahmoud Ahmadinejad’s favorite, Esfandiar Rahim Mashaei, had been allowed to run. It probably true that Rafsanjani—who still might be approved by Khamenei, if he overrules the Guardian Council—might have been relatively more willing to seek better relations with Washington. However, even if Rafsanjani had run and been elected, when he took office in August he’d still have to defer to Khamenei. Iran-watchers who expected that the election might have ushered in wholesale change would still have been disappointed. Still, reports from Tehran indicate that many Iranians are surprised and shocked that Rafsanjani was barred from running, since he was an intimate of Ayatollah Ruhollah Khomeini, the founder of the Islamic Republic, and has been a high official and kingmaker for three decades. In 2009, Rafsanjani threw his backing to Mir-Hossein Mousavi, the reformist who challenged Ahmadinejad’s reelection, and in the aftermath of the election he criticized the crackdown on protesters who took to the streets. 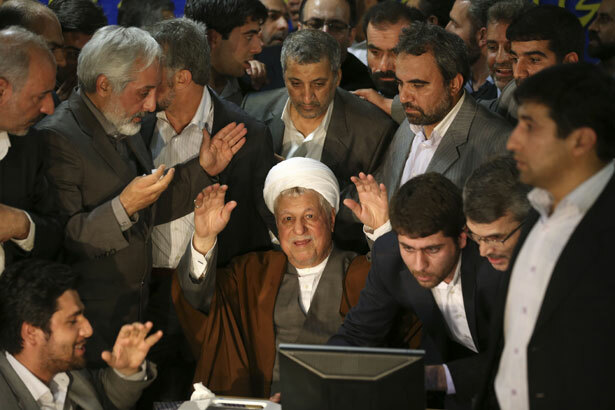 According to AP, Rafsanjani has reportedly accepted the Guardian Council’s decision, while Ahmadinejad and Mashaei intend to register a protest with Khamenei. For Iranians, the issue in the election revolves first around the economy, with growing unemployment, inflation, and with entire industries—oil and gas, petrochemicals, auto manufacturing, computers and IT, aviation—stuck in neutral, partly because of international sanctions and, more importantly, due to mismanagement by the Iranian government under Ahmadinejad. Of course, some of Iran’s economic problems might be improved if Washington and Tehran reached an agreement that could lift sanctions. It’ll be important to see how the eight remaining candidates, most of whom are conservative loyalists, will deal with Iran’s economic problems and Western sanctions. Another issue for Iranians, of course, is whether or not to make changes in the political system that’s been in place at least since 1989, when Khamenei—with Rafsanjani’s backing—became Supreme Leader. The “reformists,” led by former President Mohammad Khatami—who decided not to run—and his allies, have gingerly sought to place limits on the Leader’s power, but during Khatami’s time in office (1997–2005) those efforts were shot down by the Guardian Council after they were enacted by a reformist-dominated parliament back then. On the other side, Khamenei and the conservatives are unhappy with the very institution of the presidency. Part of the trade off in 1989, when Khamenei rose to power, was that Rafsanjani would be Iran’s president (1989–1997) and that the office of president would be strengthened. That tug-of-war continues, today, in a different form. Even if Rafsanjani doesn’t run, and it’s unlikely he’ll be approved by Khamenei, there’s still a candidate in the race around whom reformists and centrists might converge: Hassan Rouhani. He’s a cleric and senior official on the Expediency Council, and previously he served as Khatami’s chief negotiator on the nuclear issue until 2005. When he announced his decision to run for president in April, two of Rafsanjani’s children were present at the event, and Rouhani will probably get the backing of Khatami, too. (Earlier, Khatami had given his blessing to Rafsanjani.) But Rouhani can’t claim the pedigree that Rafsanjani has, and by all accounts he’s a colorless and less-than-charismatic figure. Any of the other approved candidates, including the mayor of Tehran—Ahmadinejad’s former post—and Khamenei’s chief foreign policy adviser, could catch on. Read Bob Dreyfuss on the continuing conflict in Syria.